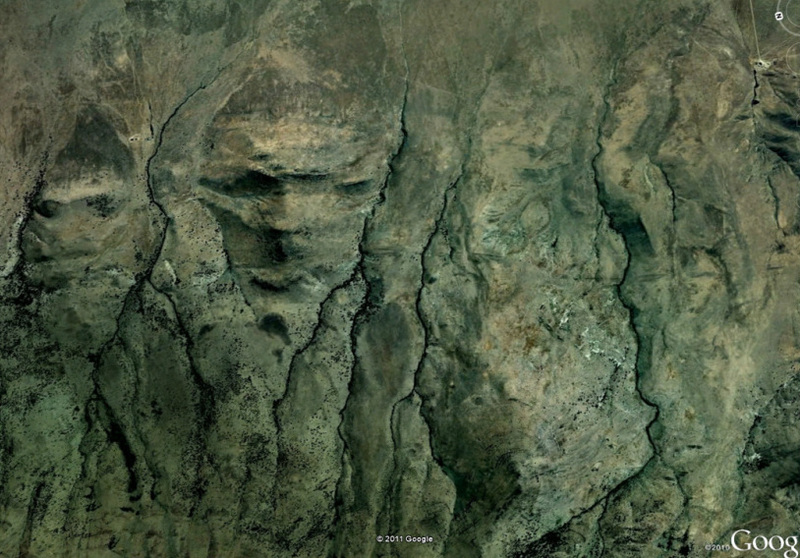 I found two walls of faces that are located on the edge of an ancient lake and a sacred mountain range to the Northern Paiute Nation. They do not look to the lake, they look straight up to the sky in different directions. They range in size from 300+ feet to over 3 miles in length. There are many possible faces in this location, but I circled the most obvious. As you notice in the upper right hand corner, this image is in a West position. Beginning with the two faces on the left. They also have pointed heads or hats as some of other faces do. With Face 1, the little one at the far left, he measures 1.28 miles and is both aligned and looks to the West. Face 2 next to him measures 1.37 miles in length and aligns West, but looks SE. From bottom point of throat triangle to top of hair Face 3 is 1.54 miles in length. Face 3 looks North and is aligned West. In Face 3 below it looks like a profile of a man with an afro? and slanted eyes with another throat triangle?